Barely a handful of days into 2017 and the winter weather has finally decided to make a notable appearance in the greater New York City area. Spring currently far off in the distance, its affiliated flourish of colorful new plant life is, understandably, nowhere to be seen. In place of this, time is filled with miles of white powder, quiet landscapes, and an openness that can feel either pleasant or disconcerting, depending on one’s mood. What does this description of the typical northeastern winter landscape have to do with music? 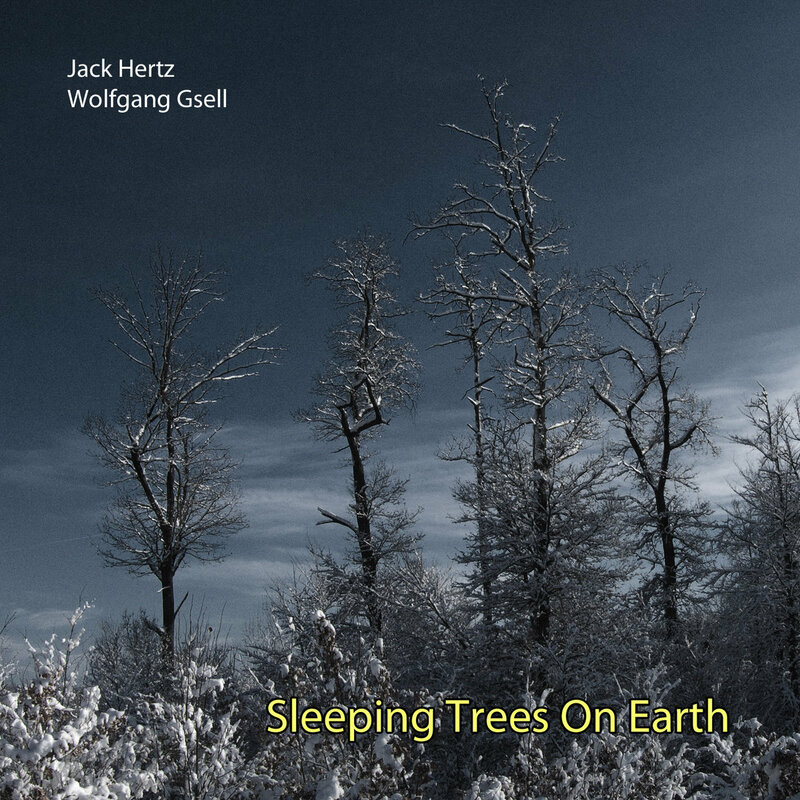 Well, one can never start musing over the thought of spring too early, and the composing duo of Jack Hertz and Wolfgang Gsell, under the label of Aural Films, appear to be doing just that and then some. The pair have just released an album this past Monday, 9 January, titled, Sleeping Trees on Earth (Aural Films, 2017). It not only speaks to a lyrical and conceptual theme of spring revival but the very way these two composers have chosen to roll out the album is focused entirely around the planting of new trees. Currently releasing Sleeping Trees on Earth through the genre-blind portal of Bandcamp, Hertz and Gsell have also partnered with the not-for-profit organization, Trees for the Future. Each purchase of the record, whether digital or physical – the latter giving an option to buy only the disc with no case or shrink-wrap in a “CD Eco” promotion – will prompt the planting of 20, 50, and 100 trees respectively. Clocking in at over an hour of audio, this project is one massive display of thematic continuity. Describing Aural Films as “an online record label (netlabel) that releases high-quality soundtrack albums for movies that do not exist,” Hertz and Gsell fall squarely in the ambient, electronic, and contemplative music space (Here’s looking at you Ghostly International “Music for…” series). The album contains a mere seven tracks but with the average length hitting over nine minutes, it’s easy to understand why. These compositions contain no lyrics and are very much in line with exuding a soundtrack vibe, even though no designated visuals exist to accompany it – at least beyond what one might conjure up in their own imagination. Long, reserved, resonating synth tones of an utterly smooth and quietly rippling variety, flood over each track. Their individual characteristics – from phaser tones, to chimes, to pure digital beeps – helping to shape and align the sonic flow with each piece’s titular starting point. All of this having been said, Sleeping Trees on Earth isn’t entirely overrun with straightforward, tonal, synthesizer based sounds. Piano given room to release and breath, for example, rings out in light flurries during “Ever Greens,” and a sampling of nightlife sounds – bugs and frogs gently chirping away – initiates the revival intended with “Spring Thaw,” before relegating to the background in favor of some punctuating crystalline tones. Relatively short closing track, “Seed Jazz” focuses on some more traditional percussion, albeit machine based, but the idea is not to be thrown by the sometimes intimidating singularity that comes with the distinction of ambient music. The tracks fade and transition seamlessly from one to the next, making the whole project almost seem like an installation rather than an album. Lending a directional hand to those that enjoy this work, yet might still struggle to latch on within the genre’s depths of overlapping sounds, from a sonic and functional perspective, a crossroads intersecting between the works of Max Richter, Daniel Rosenfeld (artist moniker C418), and Austin Wintory serve as both a way to narrow down how Sleeping Trees on Earth plays out, and a light list of similar references that pair well with Hertz and Gsell’s latest in a longer playlist. Following gradual introductions like what’s offered in this album, hopefully further exploring the abyss of electronic soundtracks/mood music seems less one-dimensional in musical character and will be a record that can transition with you from the darkness and death of winter into the warmth and rekindling of spring. Not to mention, think of all the trees that will get to grow up in the name of recreational music enjoyment! Sleeping Trees on Earth is available now from Bandcamp. Keep up with all of Jack Hertz and Wolfgang Gsell’s works through Aural Films’ official website and find Aural Films’ complete artist discography on Bandcamp.